Posted by Nicole Richards on Monday, July 28th, 2014 at 3:18pm. Sailors and boaters have their pick of great destinations on the Atlantic Ocean, the Gulf Stream and in the Florida Keys. This is no idle boast: Florida is the boating capital of the world! There are more registered boats here in South Florida than any other U.S. State. 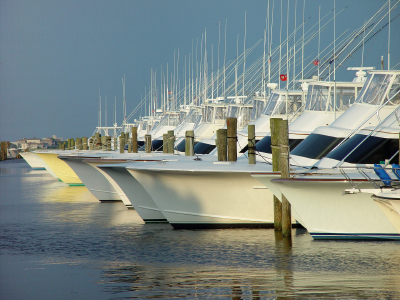 Plus, at least 100,000 out of state boats pursue South Florida waters on any given day. The tremendous arrangements for the prime cruising experience can be found along the waters of Greater Fort Lauderdale which is also known as: “The Venice of America.” This name is well known because of its mass of 300 miles of inland waterways including canals, channels and waterways. Fort Lauderdale is the “Yachting Capital of the World” because more than 40,000 yachts call it home and considering its unique boating destination. Plenty of marinas and waterfront homes with ocean access run through the beautiful coordination of the waterways. The scenery is spectacular- cruising the canals, mega mansions with their super yachts, landmarks such as Pier 66, and the all-around natural beauty of State Parks. A flock of waterfront restaurants with dockside dining at its finest and feeding the tarpons at 15th Street Fisheries provide a delightful dinner stop. The Gulf Stream runs just a few miles offshore which lure the blue-water anglers in. There are plenty of nearby coral reefs which are an underwater dreamland for divers. Imagine going to the Bahamas for a day, Fort Lauderdale is a great launching point. A not to be missed nautical destination is truly a boater’s paradise. If it’s pure bliss you have been searching for, drop an anchor in the heart of Fort Lauderdale!